Increase resolution of your video with Video Super Resolution technique which delivers unbelievable quality by using information from previous frames. Now you can convert your SD video to HD! Use hundred of VirtualDub video filters allowing you to do everything you want with your video: deinterlacing, denoising, deshaking, color correction, deblocking, sharpening, visual effects etc! Open any video and re-compress it with any video codec! ...... to create a larger and more detailed picture. No algorithm of ordinary image resize/resample is capable of providing this quality just because of the lack of information in one frame. Here you can find examples of Super Resolution technology in action. 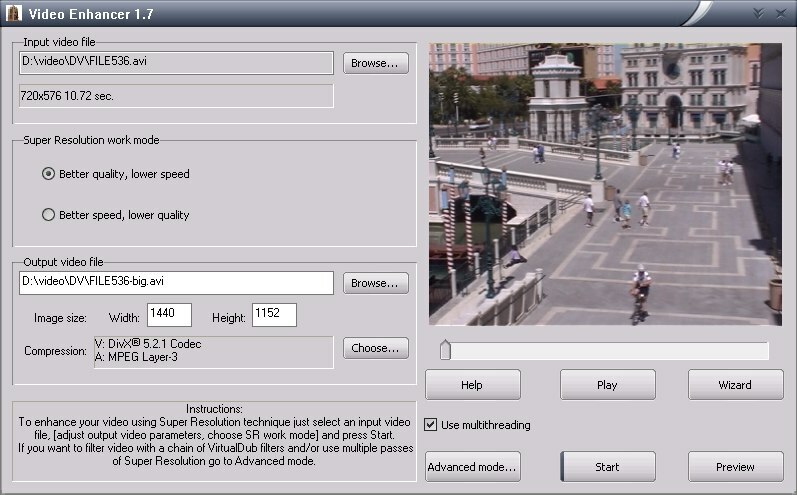 Video Enhancer allows you to increase resolution of your video with Video Super Resolution technique which delivers unbelievable quality by using information from previous frames, while all the other resize methods use information from one current frame. Now you can convert your SD video to HD! You can use hundred of VirtualDub video filters allowing you to do everything you want with your video : deinterlacing, denoising, deshaking, color correction, sharpening, visual effects etc. Qweas is providing links to Video Enhancer 1.9.7 as a courtesy, and makes no representations regarding Video Enhancer or any other applications or any information related thereto. Any questions, complaints or claims regarding this application Video Enhancer 1.9.7 must be directed to the appropriate software vendor. You may click the publisher link of Video Enhancer on the top of this page to get more details about the vendor.